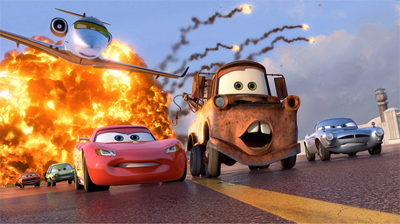 Cars 2 is a Pixar film that runs on an engine, rather than on heart. Technically, it’s magnificent. It’s well put together, features a winning cast, a lot of quite wonderful jokes and absolutely stunning action movies. However, the movie fails to make even the most basic of emotional connections. We’re always watching a bunch of cool cars doing cool car stuff, but we never feel good or bad about it. Even when a handful of cars meet tragic ends over the course of the movie, we never feel bad about it – we don’t really care about them, so we’re never concerned at the dangers they face. It’s a shame, because it’s a stunningly beautiful piece of animation, it’s just missing that wonderful soul that Pixar seems to install with its movies as standard. Road to Perdition may be the best graphic novel adaptation ever to make it to screen – and also perhaps one of the most seldom recognised (very few people seem to realise the film’s roots, perhaps because – as an Oscar contender – it played them down). It’s an old-style biblical fable set in the thirties about the lengths that a father will go to in order to protect his son, but it’s crafted with a skilled hand. It’s a genuine classic.